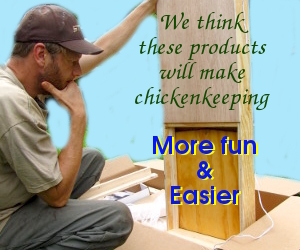 Winter is a tough time to keep your chicken flock healthy. If you’re not careful, their run will turn into a mass of mud which will erode away and pollute nearby creeks. Meanwhile, the ground will be scratched so bare that your chickens will lack all access to fresh food. Harvery Ussery suggests various solutions to these winter problems. First, he recommends that you cull your flock heavily, removing any birds you don’t really need so that the remaining chickens will have more access to wild foods. Next, how about planting cover crops to give your chickens some greenery deep into the winter? Our chickens were supremely uninterested in our oat, winter pea, and mustard cover crop in the fall, but by December, they were happily browsing through the green leaves. If your garden is completely dormant, you can also send your flock through there to clean up weeds and seeds. If you see bare soil in their run, how about turning that area into a deep bedding/compost pile? Even a small run can be biologically active through the winter months if you add enough organic matter so that your chickens can go hunting for worms. cooped up Light Sussex were thoroughly enjoying Tokyo Bekana — the thin leaves seem to be a very palatable green. Ussery even dries comfrey and stinging nettle “hay” in the summer to dole out extra nutrients to his flock through the cold months. free choice minerals or sprinkle them on top of the grain and you have a complete diet with extra protein, vitamins, and enzymes.